Vincentians are obliged to attend to the salvation of souls anywhere that God calls us: above all, in places where there is a greater need and where workers for the Gospel are lacking. The 21st century missionary paradigm does not just envision established Churches sending personnel to the so-called young Churches; rather, it sees evangelization as beginning whenever a missionary leaves his or her own culture and crosses a human frontier (geographical or social) to announce the Gospel in a new culture. The missionary not only proclaims the mystery of Christ, but is evangelized too as he or she accompanies others in the process of discovering the Spirit of the Lord already acting in a local Church or culture. We see this as a way of living that not only does the world deeply need, but that leads us to happiness as well. The St. Vincent de Paul Society encourages its membership to get involved locally in this very special ministry. Vincentians make thousands of visits to inmates each year, minister to the families of the incarcerated, and help in the rehabilitation of recently released convicts. Vincentians from all branches including the St. Vincent de Paul Society conduct many projects and programs in direct service of the poor, marginalized, elderly, children, migrants, and victims of war or natural disasters. Education continues to be an important choice in the life and work of Vincentian Family priests, Brothers, and Sisters. The Vincentian Family Colleges and Universities emphasize higher education as a means to engage cultural, social, religious, and ethical values in service to others. In our health care ministry, we serve those at their most vulnerable. It’s important to treat them with the dignity they require at that moment in time. The Charity of Christ urges us to: recognize our own value and the value of others (Respect), provide care with gentleness and kindness (Compassion), act with integrity, clarity and honesty (Simplicity), support those who lack resources for a healthy life and full human development (Advocacy), be resourceful and creative (Inventive to Infinity). A number of major hospitals and health care systems in the U.S. are run by or sponsored by branches of the Vincentian Family. In other cases, the focus is no longer on hospitals per se; Sisters can be found in nursing, health care and retirement center administration, holistic health and alternative therapies, nutrition consulting, reflexology, massage therapy, psychology and therapy. Vincentian priests serve as pastors, parochial vicars, as well as staffing a host of ministries in parishes around the world. While some parishes are located in very impoverished areas serving the direct needs of the physically poor, others respond to those same needs by calling others to participate in the mission of service and evangelization. Many Sisters of Charity are involved in pastoral ministry as chaplains, parish associates, vicars and pastoral care workers. The Daughters of Charity are involved at the parish level in catechesis, RCIA programmes, preparation to receive the sacraments, accompaniment of bereaved families, coordinating or supporting the people in those parishes which do not have a resident priest; and visiting people in their homes especially the house-bound. Placing particular emphasis on self-help and self-sustaining programs, with a special view toward addressing the root causes of poverty. Since systemic change is multifaceted and involves much collaborative activity, such projects are a good opportunity for the various branches to work together and also to cooperate with groups outside our Family. 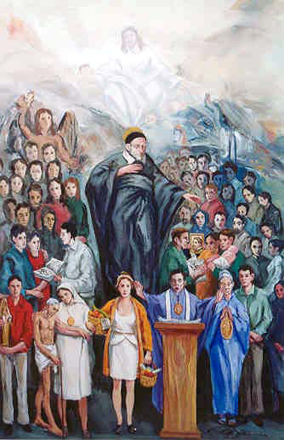 There are many Vincentian Youth associations, mainly volunteer groups of young lay people (for example the Colorado Vincentian Volunteers and the Vincentian Mission Corps, or communities of faith, service, and evangelization (such as the Vincentian Marian Youth). For more links to Youth groups, see the Related Links section of this page. The Vincentian Family has been using microfinance as an effective response to the global challenge of extreme poverty. For examples see the G.L.O.B.E. project, the Philippine Homeless People’s Federation – Community Savings and Loan Program, and Zafen (Microfinance for Haiti). The members of the Vincentian Family place increasing emphasis today on collaborative projects. Pentecost 2015 through Pentecost 2016 was declared the Vincentian Year of Collaboration.